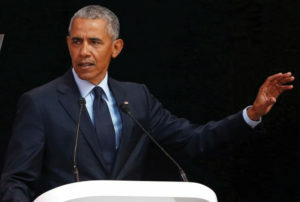 Following Trump’s embarrassing conference with Vladimir Putin, CNN reports on Barack Obama’s passionate speech on democracy in South Africa, part of an event honoring Nelson Mandela shortly before what would have been his 100th birthday. “The politics of fear and resentment and retrenchment began to appear. And that kind of politics is now on the move. It’s on the move at a pace that would have seemed unimaginable just a few years ago,” he told the crowd of around 15,000 people in Johannesburg. While not mentioning Trump by name, Obama has made it clear where he stands with warnings about many of the policies he has put into place, like protectionism and closed borders. This has been a trademark of Obama since Trump took office, putting clear criticism of his values without explicitly naming him. “I am not being alarmist, I’m simply stating the facts. Look around — strongman politics are ascendant, suddenly, whereby elections and some pretense of democracy are maintained, the form of it, where those in powers seek to undermine every institution or norm that gives democracy meaning,” Obama continued. Obama also mentioned the growing trend in politics, not just with Trump, to simply ignore and switch stances as needed, with little reprisal. “You have to believe in facts. Without facts there’s no basis for cooperation. If I say this is a podium and you say this is an elephant, it’s going to be hard for us to cooperate,” he said. “People just make stuff up. They just make stuff up. We see it in the growth of state sponsored propaganda. We see it in internet fabrications. We see it in the blurring of lines between news and entertainment. We see the utter loss of shame among political leaders where they’re caught in a lie and they just double down and they lie some more. It used to be that if you caught them lying, they’d be like, oh man — now they just keep on lying,” he said, to laughter in the crowd. Granted, an American audience probably wouldn’t find the subject matter as funny, considering we are currently living it with little end in sight.